Green Army members have been instrumental in going to schools in the city and educating students on the importance of waste management. It was a sultry 2016 summer, and the Trivandrum Municipal Corporation (TMC) had finished one of its monthly meetings to discuss what else could be done to beautify the city. Trivandrum, which generated roughly 80 tonnes of solid municipal waste daily, was having a tough time managing its waste. Lack of proper segregation awareness among people resulted in small mounds of garbage throughout the city. The consensus reached by the city’s municipal corporation was that beautification of the city was only possible when individuals became responsible for their waste. The ‘My City, Beautiful City’ campaign was launched with the message of individual responsibility. And with the launch of the campaign, the Green Army was born, entrusted with the responsibility of making students in the city a part of the beautification project. Green Army is a part of TMC and focuses on involving school children in waste management activities. Similar to the core motto of the campaign, Green Army aims to make students aware of waste management as it believes that students who understand the importance and methods of waste management will internalise and carry forward the practice. 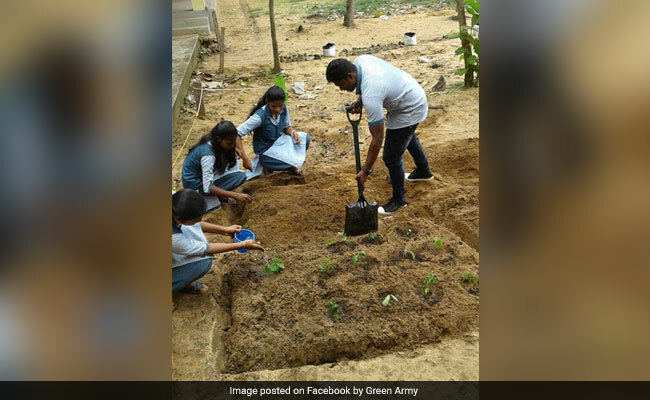 Green Army members comprise several NGO officials, volunteering organisations spread across Trivandrum, students, working professionals and retired officials. These members act as Green Army mentors, visiting schools and talking to students about the importance of handling waste in a scientific manner. We chose to focus on the schools because we were sure that once children understand the science and culture of waste management they will fully involve, internalise and carry forward the message and action in a sustainable manner, said Dr Ashin Mohan, founding member, Green Army. Debates and discussions form the core of Green Army’s methods for reaching out to students. During its initial days, the Green Army started some vacation camps in a few schools, where students were given waste management lessons and were drawn into discussions on waste management during summer vacation. Simultaneously, WhatsApp groups were also created where students participating in the camps further discussed on waste management related issues. Green Army also organised for Harita Nagarotsavams ( Green City Festivals), where students were involved in games, painting, crafts. Students painted themselves and made creatives which highlighted the problems and the ways to tackle the mounting garbage problems. The school students were also given lessons on how to compost wet or biodegradable waste and deal with plastic waste. Children suggested that the green army activity should be continued. So we slowly started forming green army units in the schools within the Trivandrum corporation limits, said Dr Mohan. Through workshops, activities and discussions, Green Army has managed to formulate a green action plan that focuses on cleanliness in sanitation spaces, waste management and planting of trees. School students are encouraged to follow an action plan initially at their schools, expand it to their neighbourhoods and then to their own homes. Once students completely understand the basics of how to ensure total cleanliness, they can go ahead on their own by visiting neighbourhoods and help people segregate waste, assist them in composting biodegradable waste and teach them about plastic waste management. This is the ultimate aim of Green Army, empower students to make them aware and self-dependent in managing waste. Each school unit can organise activities as chosen by them. The Green Army mentors provide them and their teachers support. Our activities are fully supported by the Trivandrum Corporation. Even the corporation’s health wing supports us fully, said Dr Mohan. Till now, 36 schools have been a part of Green Army’s campaign, and a total of 2,000 students have become Green Army members. Within the next three months, 65 more schools will be covered by the Green Army. In all these schools, basic orientation on waste segregation, sapling planting and recycling of disposable plastics by turning them into usable items has been imparted. Many of them have started working with the residential communities around their schools. Green Army volunteers from these schools came forward to implement Green Protocol (planting of saplings) and Plastic arrest (asking people not to carry plastic bags) during Onam 2017 weeklong celebration at Trivandrum (the annual harvest festival of Kerala). The Green Army aspires to cover all schools and colleges in the city and utilise its Green force to make Trivandrum Kerala’s cleanest city. 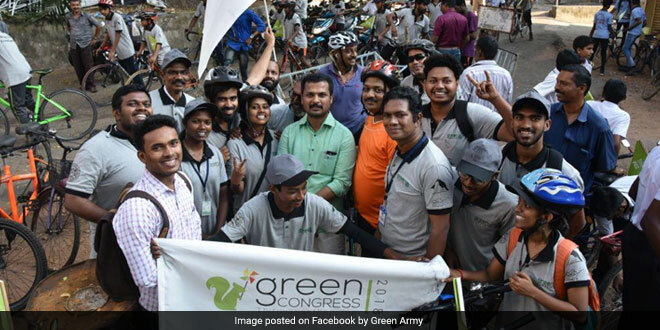 Trivandrum ranked a low 372 in last year’s Swachh Survekshan, but is hopeful of a better position this year, thanks to the Green Army’s relentless efforts to make the city’s young guns conscious about waste management, and driving them to take effective action. Green Army members are making people aware on waste segregation, management and how to avail the city’s civic services. The city civic body is hopeful that this can translate into better citizen feedback from Trivandrum’s residents, and improve the city’s rank in this year’s Swachh Survekshan. Previous Post: 60-Year-Old Tetri Devi From Bihar Sells Her Cow To Build A Toilet At Home.